A sampling of recent major achievements and developments from UC Davis Health. For more listings and news, please visit our website, follow us on social media, or subscribe to UC Davis Health System news feeds with an RSS reader. U.S. News & World Report, which annually ranks hospitals for treatment of patients with serious and challenging injuries and illnesses, has again ranked UC Davis Medical Center as one of the nation’s best hospitals for 2018–19. UC Davis Medical Center is ranked #1 in Sacramento, and is the only Sacramento hospital listed among the five best in California. U.S. News also released ratings for common types of care, with UC Davis Medical Center rated at the top level of “high performing” in abdominal aortic aneurysm repair, chronic obstructive pulmonary disease (COPD), colon cancer surgery, heart bypass surgery, heart failure, knee replacement and lung cancer surgery. The hospital met expected standards of care for hip replacement and aortic valve surgery. In June, U.S. News also ranked UC Davis Children’s Hospital among the nation’s top 50 for pediatric care in five specialties: neonatology, nephrology, pulmonology and, in collaboration with Shriners Hospitals for Children — Northern California, orthopedics and urology. Left to right: Kindred Healthcare President Jason Zachariah, UC Davis Chancellor Gary S. May, Rep. Doris Matsui and Sacramento Mayor Darrell Steinberg. A new rehabilitation hospital will be part of Aggie Square, UC Davis’ recently announced technology and innovation hub slated for a portion of the UC Davis Health campus in Sacramento. 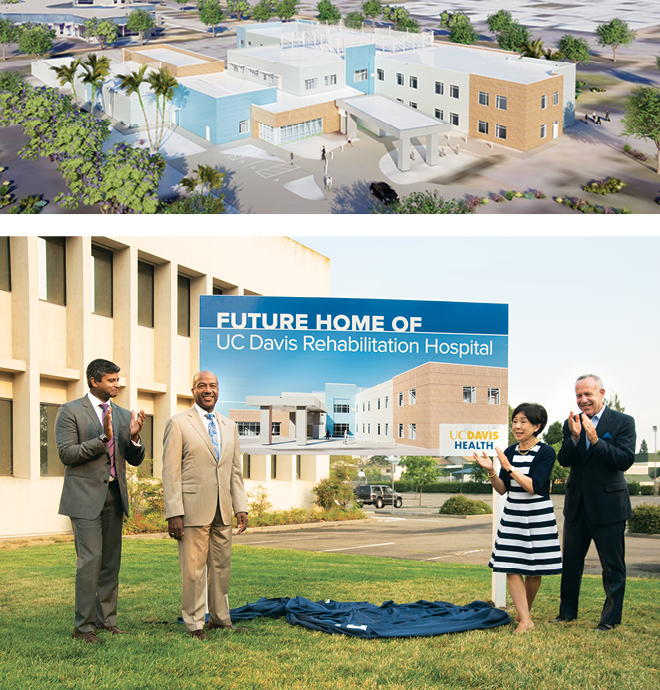 To be known as the “UC Davis Rehabilitation Hospital,” the facility will offer treatments for patients recovering from conditions such as stroke, traumatic brain injury and spinal cord injury, with all private rooms. The hospital is expected to more than double existing capacity to meet community neurological treatment, provide an estimated $60 million in capital infusion for the local area, and generate 200 new jobs in Sacramento. UC Davis Chancellor Gary S. May and Sacramento Mayor Darrell Steinberg announced the project in August with leaders such as Kindred Healthcare President Jason Zachariah and Rep. Doris Matsui, whose district includes the site. 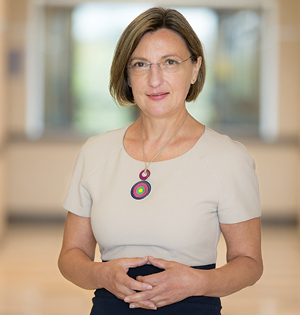 Laura Marcu, Ph.D., a professor of biomedical engineering and neurological surgery, has been named a fellow of the National Academy of Inventors (NAI). Through optical spectroscopy and imaging techniques for medical diagnostics, Marcu’s laboratory promotes better diagnosis, treatment and prevention of human diseases. NAI election is one of the highest professional distinctions for inventors from universities, governmental and nonprofit research institutions, and honors accomplishments in improving the quality of life, economic development and welfare of society. Michael Chapman, M.D., center, pictured with UC Davis Chancellor Gary S. May, left, and UC Davis School of Medicine Interim Dean Lars Berglund. 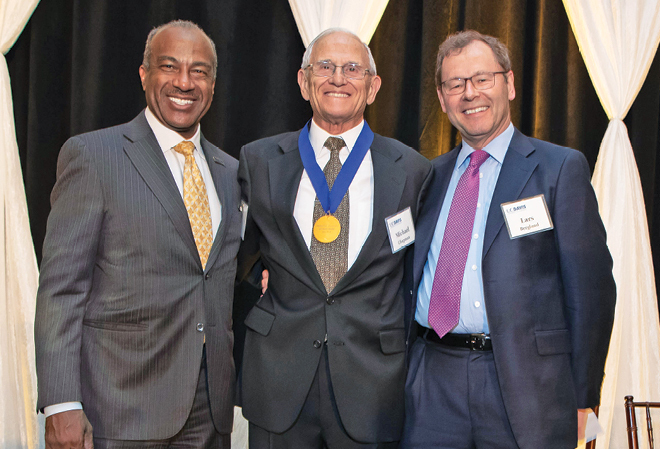 Michael Chapman, M.D., UC Davis alumnus and chairman emeritus of the Department of Orthopaedic Surgery, is the first medical doctor to be honored with the UC Davis Medal for his extraordinary personal achievements and contributions to the ideals of higher education. Chapman is one of the founders of modern trauma surgery, and earned the UC Davis Medical Center’s trauma service an international reputation. He holds eight U.S. patents, and has authored 169 publications including the four-volume Chapman’s Orthopaedic Surgery, considered a definitive text on orthopaedic surgery. 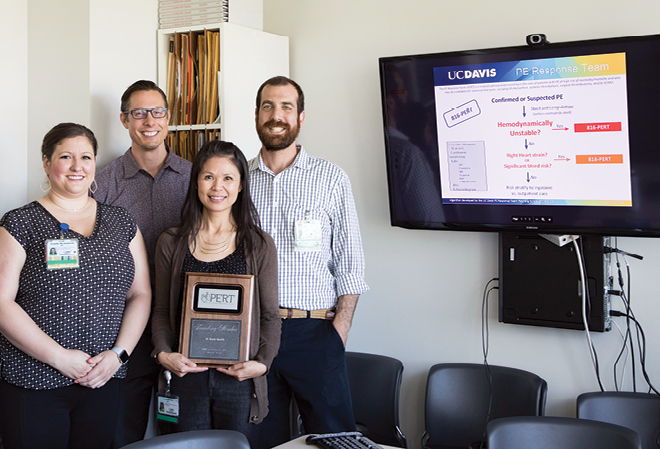 A team of UC Davis physicians and surgeons has been recognized for helping to launch a national effort to guide standards for pulmonary embolism care and research. Known as the Pulmonary Embolism Response Team Consortium, or PERT, the initiative is expected to improve survival following the nation’s third most common cause of death from cardiovascular disease. At UC Davis, PERT rapidly links experts from interventional radiology, cardiac surgery, pulmonary and critical care medicine, and emergency medicine to determine the best course of action for patients. Members also work with PERT teams nationwide to improve evidence-based standards and test new therapies. “Good food is good medicine,” says UC Davis Health executive chef Santana Diaz, shown during a pause at October’s Farm-to-Fork Festival in Sacramento. 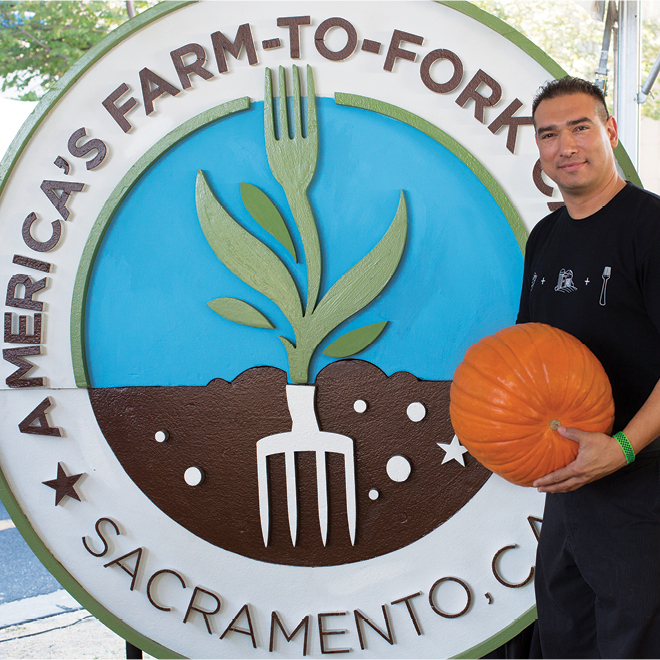 Diaz — former executive chef for Super Bowl 50 and the Golden 1 Center — and his UC Davis Health Food and Nutrition Services team are working to make UC Davis Medical Center the largest farm-to-fork food service in the nation’s farm-to-fork capital. The hospital’s kitchen is shifting toward whole-food and plant-based ingredients for the 6,500 meals it creates each day, with an ultimate goal to source most food from within a 250-mile radius. Between appearances at the Tower Bridge Dinner and other October events, Diaz and team introduced the hospital’s first farm-to-fork menu item — a short-rib sandwich with chimichurri sauce, developed with health system nutritionists and offered with a vegan alternative. Griffith R. Harsh IV, M.D., a renowned surgeon, scientist and educator, has been named chair and Julian R. Youmans Endowed Chair of the Department of Neurological Surgery in the UC Davis School of Medicine. Harsh joins UC Davis from Stanford University, where he was vice chair of the Department of Neurosurgery, director of the Stanford Brain Tumor Center, chief of Surgical Neuro-oncology, co-director of the Stanford Pituitary Center, associate dean of Postgraduate Medical Education and director of the Neurosurgery Resident Training Program. His clinical practice and research focus on innovative treatments of tumors of the brain, pituitary gland and skull base. R. Lor Randall, M.D., FACS, an internationally recognized sarcoma surgeon and scientist, has been named chair and the David Linn Endowed Chair of the Department of Orthopaedic Surgery in the UC Davis School of Medicine. Randall joins UC Davis from the University of Utah, where he founded leading-edge teams to treat and study cancers of connective tissue in children and adults; launched and led the Huntsman-Intermountain Adolescent and Young Adult Cancer Care Program; and helped develop a genetically engineered mouse that researchers worldwide use to study the molecular mechanisms of sarcomas. Pediatric telehealth leader James Marcin, M.D., M.P.H., has been named director of the UC Davis Center for Health and Technology, where he has served as acting director since 2017. Marcin will oversee a team of clinicians, faculty and staff dedicated to advancing telehealth and connected health care. Marcin joined the UC Davis faculty in 1998 and is an accomplished telemedicine clinician and researcher. Marcin is also UC Davis’ chief of pediatric critical care medicine and vice chair for pediatric clinical research, and has presented at more than 90 national and international lectures and workshops. JoAnne Natale, M.D., Ph.D., professor of pediatric critical care and director of quality and safety at UC Davis Children’s Hospital, has been elected chief of staff of UC Davis Medical Center. She is the first pediatrician to serve in the role, which involves participation in the oversight of all medical staff clinical activities such as quality improvement, credentialing and privileging, patient safety and utilization management. Natale will work closely with Chief Medical Officer J. Douglas Kirk to provide overall leadership and support to the medical staff. Carter Todd, R.N., and Sherena Edinboro, R.N., UC Davis Health nurses and graduate students at the Betty Irene Moore School of Nursing, received the 45 Under 40 Award from the National Black Nurses Association (NBNA). Their recognition stems from their leadership innovation, community partnerships, and desire to inspire others to choose nursing as a career. Todd currently conducts research in three Sacramento barbershops with the aim of increasing African-American men in nursing, while Edinboro volunteers to establish the Sacramento County Commission on the Status of Women and Girls, where she works to make the region a CEDAW city: The Convention on the Elimination of All Forms of Discrimination Against Women. The findings, published August 21 in the Journal of the American Medical Association (JAMA), were used to inform the U.S. Preventive Services Task Force, which published its updated recommendation on cervical cancer screening in the same issue of the journal. The research was led by Joy Melnikow, M.D., M.P.H., director of the UC Davis Center for Healthcare Policy and Research. Herman Hedriana, M.D., returns to UC Davis Health as the division director for Maternal-Fetal Medicine, where he will focus on premature birth risk assessment, prenatal diagnosis/screening, perinatal safety initiatives, prenatal diagnosis, fetal ultrasound, and management of labor. Hedriana has remained an active member of the volunteer clinical faculty in the Department of Obstetrics and Gynecology and is a fellow of the American College of Obstetrics and Gynecology, the Society of Maternal-Fetal Medicine, and the Pacific Coast Obstetrical and Gynecological Society. Pediatric epileptologist Trishna Kantamneni, M.D., has joined the UC Davis Department of Neurology as director of pediatric epilepsy and lead for the new four-bed pediatric Epilepsy Monitoring Unit (EMU) at UC Davis Children’s Hospital. In combination with the Department of Neurology’s adult Epilepsy Monitoring Unit (EMU), the facility will provide comprehensive assessment, medical and neurosurgical treatments for patients of all ages with seizure disorders in Northern California. Kantamneni offers care for infants, children and adolescents with various seizure disorders, with an emphasis on difficult-to-treat epilepsy and evaluation for epilepsy surgery. Janice Bell, Ph.D., M.P.H., M.N., associate professor and co-founder of the Family Caregiving Institute at the Betty Irene Moore School of Nursing, has been appointed the school’s new associate dean for research and director of its doctoral program. Bell is widely published, with more than 1,000 citations for her top five papers and dissemination in the popular press. Bell has helped create an innovative model for care navigation within congregations, and led the scientific review for a national panel defining an implementation framework for serious illness care. Iyda Antony, CLS, M.B.A., former director of laboratory services for Kaiser Permanente in Santa Rosa, has been named director of pathology and laboratory medicine at UC Davis Health. She will work closely with pathology Chair Lydia Howell, M.D., to oversee operational aspects of laboratory services, foster staff development, and improve patient-physician satisfaction. Prior to joining UC Davis, Antony served as the vice chair for Northern California Kaiser Regional Lab Directors group and managed the technical and clinical components of the department. A new website launched by the UC Davis Clinical and Translational Science Center offers information to investigators and volunteers about actively recruiting clinical studies and the criteria needed to join. The new site, www.studypages.com/ucdavis, allows volunteers to browse and connect by study categories and enroll with the click of a button. Investigators can also use the tool as a resource to help with recruitment, scheduling and analytics.